This portrait features a middle-aged man whose face, with pronounced cheekbones, is dominated by almond-shaped eyes with asymmetrical, arched eyebrows. The face is characterized by prominent nose, full and tight lips and receding chin. 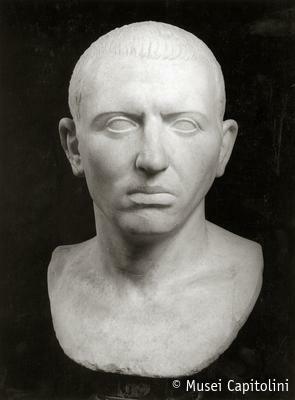 portrait, however, can be dated to the late Augustan age.